Transport bosses have criticised plans for daily £100 fines that form part of a clean air zone strategy for Greater Manchester. High-polluting buses, lorries and taxis are due to be fined from 2021 if plans are approved by the government. Privately-owned cars will not be affected, the Greater Manchester Combined Authority (GMCA) added. 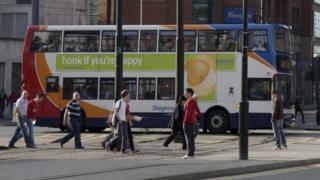 Gary Nolan, who represents the region's bus operators, said "buses should be seen as the solution, not the problem". "Making bus services a lot better, will move people out of cars… once you get more people using buses, there's less congestion, less pollution - simple." The penalty for driving a high-polluting bus or lorry would be £100 a day, and for a high-polluting taxi, £7.50 a day from 2021. Christopher Snelling, from the Freight Transport Association, said the daily fines would mainly affect small firms using lorries who could relocate to outside the region or stop doing business in Greater Manchester. He said that the rate of firms' renewing their fleets means all their vehicles would meet Euro standards after a few years. "The problem we have with clean air zones like this is they're not a big help [...] all they do is bring forward what is going to happen in two years' time anyway. "It's about achieving legal compliance so the UK doesn't get fined and that's why we find it so frustrating." Green campaign group Friends of the Earth said previously that clean air zones must "must include all vehicle types" and that it was "dismayed" that Greater Manchester "will not tackle illegal levels of air pollution before 2024". If approved, Greater Manchester would have the largest clean air zone outside of London by 2024.